Grandma's favorite old fashioned Christmas cookie recipes will let you make a wide assortment of colorful, rich-tasting cookies that are perfect for serving to your guests at Christmas time and throughout the holiday season. When used as a centerpiece, platefuls of these fancy holiday cookies will make your dessert table look fantastic. 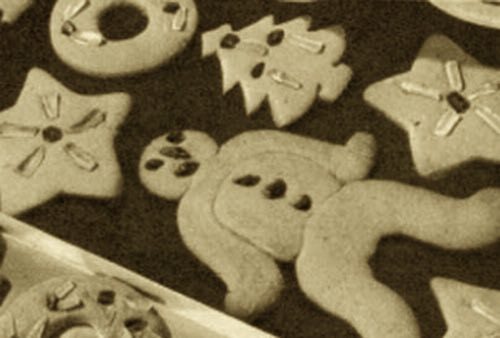 Select several of these recipes for homemade Christmas cookies and get a big head start on your Christmas baking. Sift flour once, measure, add baking soda and spices, and sift together three times. Boil honey, sugar, and water 5 minutes. Allow to cool. Add flour mixture, eggs, fruits, and nuts. Work into loaf and place in refrigerator. Let ripen 2 or 3 days. Roll on slightly floured board to 1/4-inch thickness. Cut in strips, 1 x 3 inches, or in traditional shapes. Bake on greased baking sheet in moderate oven (350°F) 15 minutes. When cool, cover with a transparent sugar glaze. May also be decorated with white icing and chocolate piping. Lebkuchen should ripen in a cake box at least one day before they are served. Makes about 10 dozen lebkuchen. 1/2 cup butter, 1-1/2 cups brown sugar, 1 egg, 1-1/2 cups all-purpose flour, 1 teaspoon vanilla, 1 cup coarsely chopped pecans and extra whole ones for topping. Beat together butter, sugar, egg until creamy, then add remaining ingredients in order given. Chill. Between your palms, shape dough into balls 1 inch diameter, place 3 inches apart on buttered sheet, flatten to 1/8 inch thick with tumbler. Decorate tops with whole pecans. Bake at 375°F for about 12 minutes. One-half cup shortening and honey, 1 whole egg, and 1 egg yolk, 1/2 teaspoon salt, 1/3 cup sugar, grated rind of 1 lemon, 2 cups pastry flour, 1 teaspoon baking powder, 1/2 cup sliced glazed cherries, 1/2 cup shredded mixed peel, 1/8 teaspoon mixed cinnamon and nutmeg. Mix in the ordinary way, drop from a teaspoon onto a buttered sheet. Flatten out tops and spread with slightly beaten white of eggs, mixed with 1/2 cup chopped, blanched almonds. Bake in a moderate oven. One cup of pulverized sugar, whites of 3 eggs, 1 heaping cup of nut meats (such as hickory nut meats), a pinch of salt. To the very stiffly beaten whites of eggs add sugar, salt, and lastly the nut meats. Drop teaspoonfuls of this batter on a greased, floured baking tin. Bake in a moderate oven. Cream shortening and sugar; add molasses and beaten egg. Sift together dry ingredients: flour, soda, spices, salt; add to first mixture and mix well. Wrap dough in waxed paper and chill. Roll dough 1/8-inch thick; cut gingerbread men and other Christmas gingerbread shapes and decorate with colored gumdrops and raisins. Bake on greased cookie sheet in moderate oven (325°F) 10 minutes. Who doesn't like ginger snaps? 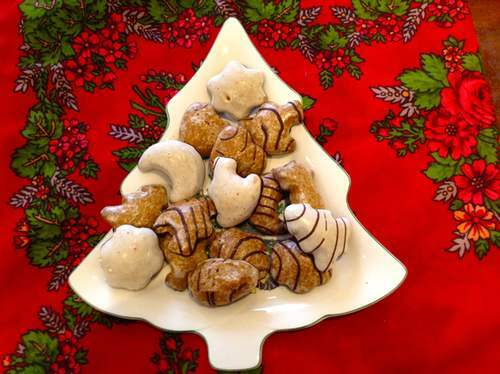 This ginger snap recipe is perfect for the holidays. You'll enjoy serving these festive-looking, whipped cream-filled ginger snaps with their delicate maple syrup flavor. One half cup maple or golden syrup. Let this come to a boil, then add 3/4 cup granulated sugar, 1/2 cup flour, sifted with 1 heaping dessertspoonful ginger. Stir well, then spread on a well-buttered sheet. Bake in a slow oven about 12 minutes. Cut at once into squares and roll into cone or cylinder shapes while warm. When cold, fill with sweetened whipped cream, and serve at once. The whipped cream may be tinted red or green with food coloring or left white. 2 eggs, 1/4 cup melted butter, 1-1/4 cup sugar, 2 tablespoons orange juice, grated rind one orange, 1 cup flour, 1/4 teaspoon allspice, 1/2 teaspoon cinnamon, 1 teaspoon salt, 3 teaspoons baking powder, 4-1/2 cups soft bread crumbs. Method: Beat eggs, stir in butter. Beat in sugar and add orange juice and rind. Sift flour, spices and baking powder. Stir into egg mixture and add the fresh crumbs — they must be fine. Drop by the spoonful onto cookie sheet. Bake in a moderately hot oven (375°F) until brown, about 20 minutes. Makes two dozen. 2-1/2 cups sifted all-purpose flour, 1 tsp salt, 1 cup butter, 2/3 cup sugar, 2 tbsp grated orange rind, 1 tbsp grated lemon rind, 2 eggs well beaten, 1 cup shredded coconut. Sift flour and salt; beat butter until it is creamy; add sugar beating all the time; add orange rind and lemon rind, beaten eggs, mix well; add 1/2 the flour, mix; stir in the coconut, add rest of flour, mix; drop on ungreased sheet and bake 375°F 10 minutes. Spread with confectioners' sugar icing tinted yellow or red on each, then decorate with grated orange and lemon peel and cherries. Makes 4 dozen. You'll be able to use this versatile cookie mixture to make a whole variety of cookies you will be proud to serve or use for gift giving. 2/3 cup shortening, 1 cup brown sugar, 2 eggs well beaten, 2 tablespoons milk, 2 cups flour, 1 teaspoon baking powder, 1/4 teaspoon baking soda, 1/4 teaspoon salt, 1/2 teaspoon vanilla, 1-1/2 to 2 cups nuts or dried fruits. Sift the dry ingredients. Cream the shortening, gradually beat in the sugar, add the beaten eggs, mix well, and add the dry ingredients alternately with the liquid. Fold in fruits and nuts. Drop the dough in small spoonfuls about an inch apart. Rich Tasting Christmas Cookies: To the drop cookie mixture, omitting nuts and dried fruits, and vanilla, add 1/2 cup citron peel, 1 cup sultana raisins, 1/2 cup glacé cherries, 1/2 cup sliced blanched almonds, and 1 teaspoon almond extract. Coconut Drop Cookies: To the drop cookie mixture, omitting nuts and dried fruits, add 1 cup shredded coconut. Oatmeal Drop Cookies: Make the drop cookie mixture omitting dried fruits and nuts and using only 1-1/2 cups of flour. Add 1 cup rolled oats, 1 cup chopped dates, 1/2 cup walnut meats if desired, 1/2 teaspoon cinnamon, and increase the soda to 1/2 teaspoon. Fruit Patty Cakes: Make the drop cookie mixture having it include 1-1/2 cups of mixed raisins, peel and nuts, and adding 2 extra tablespoons of milk. Drop by spoonfuls in buttered patty tins and bake in a fairly hot oven. Hermits: To the drop cookie mixture, omitting the nuts or dried fruits, add 1 cup raisins, 1/2 cup coconut, 1 cup chopped nutmeats, 1 teaspoon cinnamon, 1/2 teaspoon cloves, 1/2 teaspoon nutmeg. Date and Almond Drop Cookies: To the drop cookie mixture, omitting the nuts or dried fruits, add 1/2 cup chopped almonds, 1-1/2 cups chopped dates and 1/2 teaspoon almond extract. Grandma's old fashioned Christmas cookie recipes are just what's needed to do your Christmas baking. You can easily make an assortment of fancy cookies for New Years, birthdays, or other special occasions too. Imagine serving your guests a variety of colorful, festive-looking cookies that are wholesome and taste every bit as good as they look.